These are comfortable, professional looking and keep your feet secure whilst on duty. What rating would you give these Savage Island Police Boots? NEW IN – Get these Savage Island Police Boots available online today with some big discount! The Boots are made from genuine Black leather and heavy duty nylon. They are designed to be lightweight, comfortable but able to take the knocks of a modern police officer or PCSO. The sole has a Steel Shank within to reduce fatigue on your feet whilst on duty. The laces are secured with strong bronze eyelets which mean your feet are comfortable and give you a better fitting. 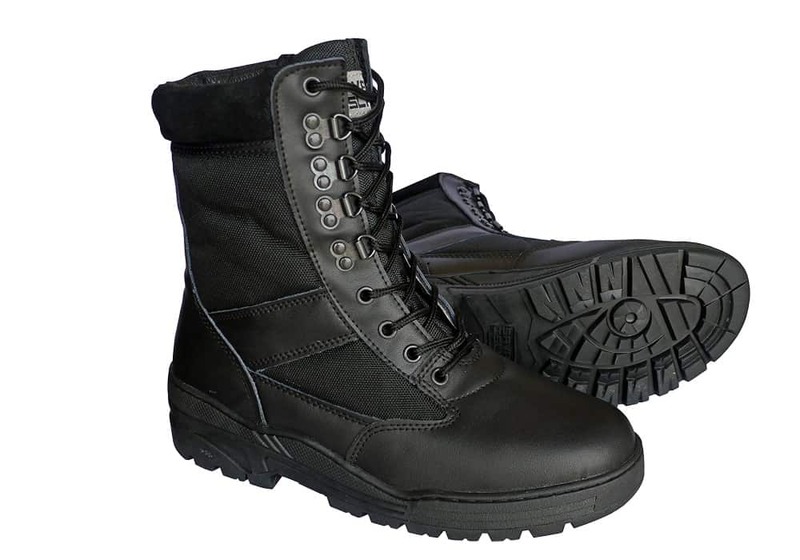 These boots are ideal for anyone from the Police Community or officers from the security industry. How much do you spend on Police Boots? The amount each person spends on their Boots will vary greatly, as the Boots available can start from as little as £20 and range up to prices of £200. So what is the most important aspect of your Boots that you need to consider when buying? I would say comfort being right at the top and then you really do need a waterproof boot. Police Officers and Police Staff can spend many an hour out in the harsh weather conditions and so they need to be water tight! These Police Boots by Savage island are not completely waterproof but do provide you with good water resistant material, so unless you have gone for a swim, they should be fit for purpose. The price on these boots makes then in the bottom end of the price market, so they are the budget boots. However don’t be fooled by the price tag as they provide both water resistant and comfort to the wearer, therefore making these a good fit for any police or security role. Do you own a pair of these Police Boots by Savage Island? If you have a pair of these boots and would like to share your experience with our community, then make sure you comment below and give them a rating. Let us know how they fit and how much you paid for them. This information will help all our users and picking the right pair of boots at the right price!